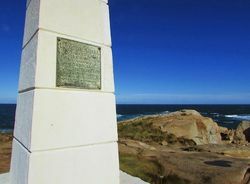 A monument commemorates the naming of Point Hicks by Captain James Cook after Zachary Hicks who was the first European to sight the east coast of Australia on Cook`s voyage of 1770. Captain Hicks was James Cook`s senior lieutenant. There has been some dispute as to whether Zachary Hicks actually saw Point Hicks or whether he saw Ram Head about 20 kilometres further up the coast. Although Cook named the promontory Point Hicks it was changed to Cape Everard in 1843 and did not return to Point Hicks until it was renamed in 1970. There was some doubt to whether this was Cook`s first landfall in Australia in 1770, because Cook had not taken account of crossing the International Date Line when recording his log. Therefore it was not challenged when the cape was later named Everard. In the lead up to Cooks bi-centenary, research was undertaken and the case was presented successfully to restore the rightful name. Accepting a suggestion by the Royal Australian Historical Society the Commonweath Government has decided (says the Melbourne "Age") to commemorate the epoch-making voyage of Captain Cook along the eastern coast of Australia by placing suitable memorials in prominent landmarks, one at Possession island and the other at Point Hicks. These memorials consist of brass plates with raised bold lettering. 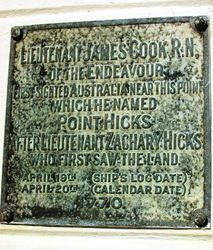 On the tablet at Point Hicks will appear the words suitably set out: "Lieutenant James Cook, R.N., of the Endeavour, first sighted Australia near this point which he named Port Hicks, after Lieutenant Zachary Hicks, who first saw the land, April 19 (ship's log date), 1770." The inscription on the tablet for Possesion Island is: " Lieutenant James Cook, R.N., of the Endeavour, landed on this Island, which he named Possession Island, and in the name of His Majesty King George 111 took possession of the whole eastern coast of Australia from the latitude of 38 degrees south to this place, August 22, 1770." 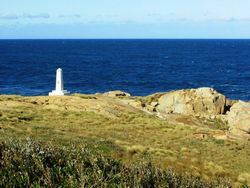 The Queensland Government has consented to undertake the work of affixing the tablet at Possession Island, while that at Point Hicks will be placed in position by the Director of Lighthouses. 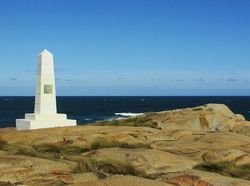 These two memorials are the last of a series placed at different points along the eastern coast ofthe continent to perpetuate the memory of the great navigator. North West Champion (Moree, NSW), 27 November 1924.
Who First Saw The Land.